One of the best things about summer are all of the farmers markets. Farmers markets nationwide are experiencing a rebirth, as more people are demanding local, fresh and chemical free products. Luscious tomatoes, golden corn, onions, radishes, eggs! 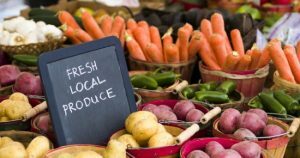 August is the perfect time to go to the local farmer’s markets that are near the FRESHWATER VACATION RENTALS property that you are renting. If you rent Tazelaar Cottage in Holland, the Holland farmer’s market is open Wednesdays and Saturdays from 8am – 4pm, and it’s fantastic. If you are staying at one of our fabulous Union Pier cottages, Skip’s open-Air European Framers Market is the place to go in New Buffalo MI. Anywhere you go for vacation in Michigan during the month August, you are certain to find a farmers market near you on Saturdays. Go – you will not regret it!